Good Location. Good Title. Serene Neighbourhood. 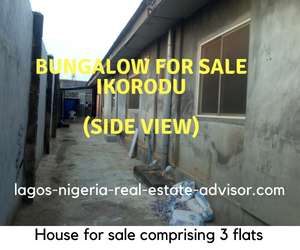 House For Sale Ikorodu Lagos Nigeria: We have house for sale in Igbogbo area of Ikorodu Nigeria. 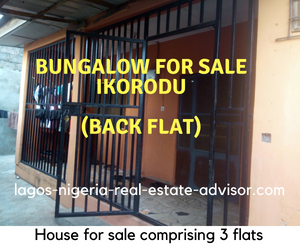 This Igbogbo Ikorodu property for sale is a bungalow comprising . . . The location is in Igbogbo town, about 5 minutes walk from the Igbogbo health centre. This property for sale in Igbogbo Ikorodu is positioned in a good location. It is fenced round and in a short, quiet close with a lot of privacy. The property is located just two streets from the 6-lane major highway (under construction) linking Igbogbo town to Ijede town and Gberigbe. And from there you can connect Ikorodu Ijebu-Ode road. This house for sale in Ikorodu is in a good location. The good news is . . . the property is owner occupied. That means the property is occupied by the owner. The best part is . . . the owner and his family occupy the 3 bedroom flat while the two other flats are free of tenants. Yes, no tenant in the property! This means the investor who buys this house for sale in Igbogbo Ikorodu will easily take possession of the property after purchase (unlike some buyers that have to wait several years before they can evict trouble-some tenants from the property they have already paid for with their hard-earned money). 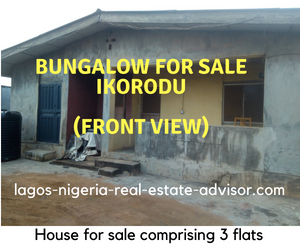 House For Sale Ikorodu - Good Title. Easy Access To Health Centre, Market And Highway! Looking for a trouble-free property with potential for high return on your investment? Call Samson Itoje on 07086459367 or 08033290430 to inspect and buy this property for sale in Igbogbo Ikorodu Lagos Nigeria.